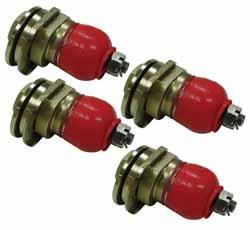 This adjustable upper ball joint makes front camber adjustments a breeze. By replacing the factory ball joint, this sliding ball joint allows for greater camber changes than previously available. Incorporating an OE quality replacement ball joint, this sliding plate assembly is perfect for vehicles that have been lowered for performance, or retain the factory height. For changes greater than +1.5° check out our Extended Range Ball Joints. Able to change camber from +1.50° up to +3.0° these ball joints are perfect for lowered vehicles. Replacement for your factory ball joint. No adjustment from this ball joint alone, but a reliable compliment to other alignment components.